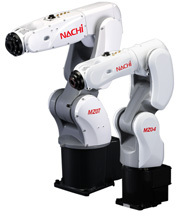 For sure support in your advanced machining workshop, you can rely on Nachi-Fujikoshi, a long-running world leader in the field of industrial robotics. 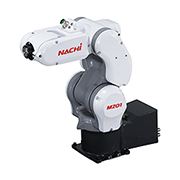 Accumulated through work on vehicle production lines, successfully meeting the ongoing challenges of ever-advancing industrial production, our focused expertise with automation means you get both the most advanced robots and the confidence that they will go on working reliably. Great for high density layouts. Stops safely when contact is made with person. Pinch points and sharp edges eliminated for safer human interaction. Leads its class in speed in precision. Footprint is 17% smaller than conventional robots. Through-arm cabling and air piping included. Space saving for equipment layout by inverted mounting. 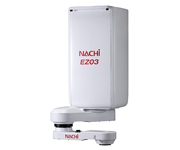 Thanks to its slim arm, high speed operation is possible. Also inverted mounting allows the robot to travel the shortest path. A large, 36 mm-diameter hole in the tip of the wrist. With all wires and tubes built into the machine body, the risk of interference reduced, hence reliability is improved. 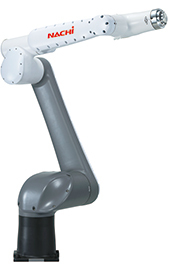 The lightweight and compact robot arm helps keep the equipment simple and saves space. 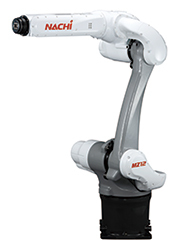 The MZ04/MZ04E robot is designed to be compact. The installation area is half that of the MZ07 (A5 paper size). Cable and tubes can be routed through hollow wrist. Wide range of options can satisfy all needs at a production worksite. The next generation of hollow arm construction spot welding robots. Cables for welding gun are fully enclosed to increase cable reliability and improve rate of operation. Contributes to installing directly in the assembly line and improves operational accuracy of offline programming, including welding cables. With plenty of wrist torque and large operating envelope, these robots are opening up a new era of heavy loading robots. Welding cables and hoses packed tightly inside arms with hollow construction. For customizing the display on your Teach pendant. Create FlexGui screens by drag and drop. Intuitive display enables easy operation and speedy trouble shooting.